Y'all know how much I love Livebinders. Around our office we use them all the time to organize resources and share the good stuff with our teachers. Tina and Barbara (the Founders) have created a great product that really meets a lot of needs for teachers and are always willing to listen and seek out advice for changes they want to make. Last year they unveiled a contest to have educators vote on the Top 10 best Livebinders around. 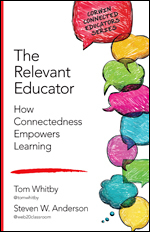 I was humbled to have two picked by my fellow educators to make that list. 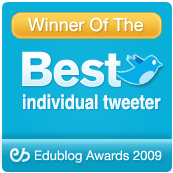 My Twitter In Education and QR Code binders both made the short list and it really was pretty awesome. 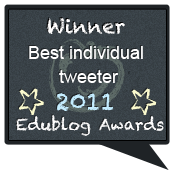 Nominations just closed for 2012 and my Twitter Guide for Edu binder was again nominated. So if you want you can head over to the Voting Binder and cast a vote my direction. The nifty part is that you can see all the great binders that have been nominated. Everything from iPad resources to Presidents to math binders have all been nominated. Its a great resources to just find great content. Below is my Twitter Binder for you to take a look. Its got more Twitter resources than you can shake a stick at and is constantly being updated with new information. I hope you can throw some votes my way!